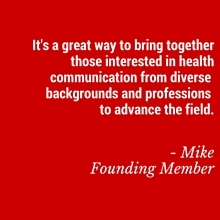 We bring together health communication professionals, students, and scholars to create meaningful connections, share knowledge across disciplines, and advance the science of health communication. The Society is a member-driven organization that relies heavily on digital media to unite the field, bridging the gap between public health, healthcare, digital health, academia, and research. If you share our interests in networking, best practices, advocacy, and training, we hope you'll become a member today. We're changing the way health communication professionals collaborate, and we want you to be part of that movement. We're looking forward to seeing many of our members at the 3rd Annual National Summit for Health Communication on April 24th at the National Institutes of Health (NIH) – Bethesda campus. Registration for this event is now closed. Sign up for our email updates to learn about more upcoming events. The Society is working with a number of leading academic programs to advance the field of health communications. Learn more. Looking for a job in health communications? Society members have access to our online jobs board, which is updated weekly with professional development opportunities around the country. Join our collaboration and get your organization involved today!